Recently, I was hunting at a New Hampshire beach with my Excalibur II, and 5 minutes in I got my first signal which turned out to be an encrusted Mercury dime. I thought to myself this is going to be a good day. I just put it in my pouch and kept on swinging. At that point I decided to head into the water. I looked down and saw a piece of aluminum trash, I scooped it up and put it in my trash pouch like any good detectorist would. Only a few steps and swings later, I got a blasting signal that I had to dig. I took my first big scoop, and no target was to be seen. I swung the coil over the area again, and the signal got even louder, I scooped down again, and still nothing in the scoop. I had to repeat swinging over the area and scooping a total of 5 times before I finally had the target! I looked at my scoop and saw a huge piece of chain hanging over the edge shining in the sunlight, the rest of it was still covered in muck. I slowly started pulling the chain out of the muck and couldn't believe how heavy it was. I finally got to the end of the chain and saw a medallion attached. I was so happy I couldn't stop smiling the rest of the hunt. 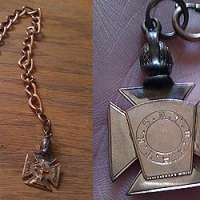 I didn't know what this peculiar chain with pendant was at the time of recovery but I knew it had to be something special. 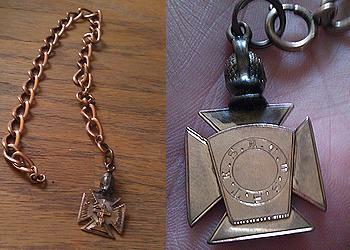 It turns out that I found an old Knights Templar 25th degree Masonic watch fob and chain. There were 3 types of gold used, 14k rose gold, 14k yellow gold, and 12k yellow gold. The weight of all the gold is 1.685 Troy ounces. This is the best find I've made thus far. Thank you Minelab for helping me save this awesome piece of history!